This symposium will engage all those who regularly look at, think about, and make art—especially art students and faculty, artists, art critics, and curators. Through a participatory workshop on positionality in the classroom, as well as panels and workshops on critical pedagogy, experiential learning and critique we will investigate the ways art is discussed, valued, and taught, generating new strategies for the training of artists and critics, with a particular emphasis on what it means to decolonize places of learning. 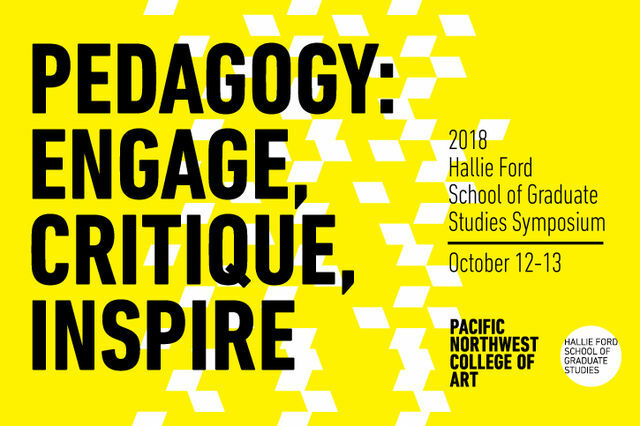 The keynote address will be delivered October 12 at 6pm by Allan deSouza, Associate Professor and Chair of Art Practice at the University of California, Berkeley. deSouza’s forthcoming book, How Art Can Be Thought: A Handbook for Change (Duke UP, 2018), examines popular terminology through which art is discussed, valued, and taught. It emphasizes thinking and talking about art as active processes that not only produce meaning and direct how viewers experience art, but which steer artists through the discursive foundations from which art is produced. We will have ASL interpretation for the Symposium Keynote event with Allen Desouza. Can’t make it to the event day of? Click here to livestream.